About five years ago, I bought an elliptical. My third (living) child had just turned one. In the previous five years, I had carried three babies to term, one baby to half term, and had nursed three babies for a year each. It took a number on my body and I wanted to get into some semblance of shape. The elliptical I purchased had pre-programmed workouts. It changed the resistance and incline for you at different intervals and told you how fast to go, changing speeds as the workout went on. I tried out a simple 20 minute workout and I about died after five minutes. Seriously. I didn’t know if I would ever be able to complete a 20 minute workout! Never-the-less I pressed on. I spent a few works working up to being able to complete the 20 minute workout. It was hard for me in the state I was in. Jump ahead five years. I have been consistent and faithful in my exercising. I have added more than the elliptical to my life. Today, a 20 minute workout is basically a cakewalk. I typically do 50-60 minutes when I get on the elliptical now. I am sweaty when I am done and I have pushed myself, but I never think death is around the corner. I actually reach that state of endorphins flowing through my body from the exercise. If you challenged to only work out on my elliptical for 20 minutes, I would smile and do it happily with my hands tied behind my back if you wanted me to. About ten years ago, I had my first child. The hours were long and hard. It was a shock to my system. I stressed about sleep (for me and my baby!). I about died. I wondered what we were thinking having a baby. Why would we do that to ourselves? I thought I could not possibly make it through each day until my husband got home to offer some sort of relief, even if only mentally. I worried about everything. I analyzed everything. I felt like I had no time to myself. A baby waking up early from a nap left me pondering and analyzing for hours. Then the child grew to be a toddler and another one came and my worries only continued. How would I potty train? How would I keep my house as clean as I wanted to? Why even bother washing windows when they would get dirty ten minutes later? When would I ever go to the bathroom alone again (I mean, a couple of times I had a child on my lap people). These parenting dilemmas were hard for me in the state I was in. Ten years later, I know why the phrase “Little kids, little problems. 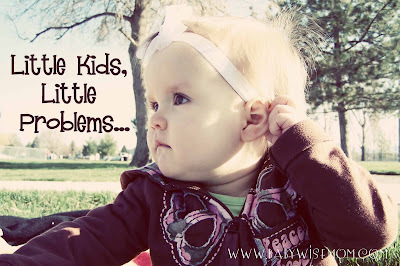 Big kids, big problems” exists. I would love for my biggest concern right now to be a child waking early from a nap as it was ten years ago (and I know–my kids have a lot of growing left to do which means bigger problems to come my way). I could solve that early waking problem with my hands tied behind by back if you challenged me to. Admittedly, the bathroom thing is still an issue–kids have a radar! I swear (though luckily it has been many, many years since a child was on my lap). Even so, I have built up a tolerance and endurance for facing such bathroom invasions. That is annoying, like a fly can be annoying, but I have larger worries on my mind. I am facing decisions that have long-term effects and implications on my children’s lives. Boundaries and rules, activities, advice on friends, freedoms allowed, moral teachings…it is a lot heavier than early waking. However, I must say this. In no way would I ever consider dismissing another mother’s struggles with those long, endless and lonely early days as “little problems.” I would never tell a mom with two young children she shouldn’t worry about nap length because some day the stresses will be bigger than that. Just like I slowly built up my endurance on my elliptical all those years ago, I have slowly built up my parenting endurance over the years. Yes, I can go back and do a workout now that just about killed me five years ago without even breaking a sweat. I can do that because I have been exercising those muscles consistently for five years. I have also been exercising my parenting skills for many years. Ten of them. Of course those issues that caused me to sweat ten years ago won’t now. I have bigger “muscles,” years of experience, wisdom, and hindsight all working in my favor. But I had to work to get here. I had to face those hard days in the early years to build that endurance up. Change is not a future event, but a present day activity. Each day, I got stronger as a parent. Each day I tried again. Each day, I learned from my parenting mistakes that had come in the days before. I put in effort to become a better parent. That effort has allowed me to get strong enough to face the bigger hills today. The problems we face today help us to get stronger to face our bigger concerns tomorrow. If we dismiss them without dealing with them and facing them, we do not gain the strength we need to. Having little children is hard! They are hard even if they bring with them “little problems.” There do not need to be any apologies for feeling that way. Those feelings do not need to be dismissed. Maybe some day you will look back fondly on some of those hard things, but right now they are piling up and can make you want to crack. That doesn’t make you weak. That doesn’t make you inadequate. That doesn’t make you ungrateful. That makes you a young mother experiencing life as a young mother. Take the time to work through those feelings and emotions. Take the time to learn how to stress and worry over problems for your children, even if it is “just” naps. Work through these little problems. By working through these things, you will learn how to process problems for your children and be better prepared to help them with their “bigger” problems as they get older. You are building your endurance and strengthening your muscles for your years ahead you still have as a mother. Yes, some day you will remember some things fondly that currently just drive you crazy. Yes you will miss some things (a lady at church swears to me she misses the constant fingerprints on her windows). But that future doesn’t not change the difficulty of today. And let’s be honest. We humans tend to forget certain details of things. Once we are out of the thick of things, we can’t quite remember what it was like to be so consumed in those “little problems.” My children want snow in the summer and sun in the winter…we forget the worst parts and recall things in a very positive light. So never feel silly for having little kids with little problems. Do not let other people dismiss your difficulties. Right now, they are big problems to you, and that is your reality. Just like you built endurance in your arms for carrying your baby (remember when your arms got tired from holding an 8 pound baby for a while? Now you haul that 35 pounder around like she is a little pillow on your hip), you are building endurance for parenting these little ones. Take each difficulty and learn what you need from it. That includes feeling the frustrations, pains, quandaries, successes, and joy that comes with it. I needed to hear this today, thank you! As a first time mom, I am driving myself crazy over the "little problems." Truly in the grand scheme of things they are small…how can I get him to nap longer, after his transition from his napper to the crib, he is taking shortened naps and waking fussy. Should I do this, or this…should I follow this advice or this…I'm making myself super anxious over something that really shouldn't be causing anxiety. I know this isn't a huge issue and I need to remember I have a happy and healthy baby boy and am doing the best I can. Thank you for your blog. I feel like it has been a wealth of knowledge. You are so welcome Nicole! Wonderful read thank you !